Actually I am only telling you a half truth. The latest bits from Lee Valley will give you a square hole and does use a drill, but there is more to the story. This new tool is actually a fancy square hole punch that uses a drill bit to remove most of the wood material. For those of you wondering, yes, it functions almost exactly the same way as an electric mortise machine. Using the punches seems simple enough. 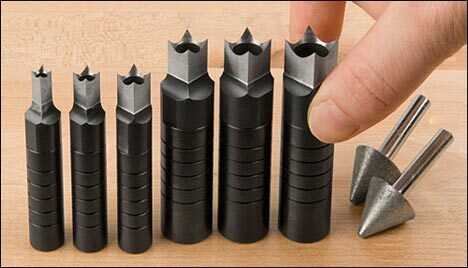 You start out by drilling a hole 3/64” smaller then the size of the punch you are using. In the next step you slip the punch over the bit while it is still in the wood. Next you square up the punch, then remove the bit. While holding the punch with one hand, you remove the bit with the other. Now you can grab your mallet and start the chiseling process. The bad, it looks like you can get only about a 1/2” of cutting depth out of these. While this is not a mortise machine replacement, it was never really meant to be. Its true design function is to add simple square decorative accents to your woodwork. The punches come in six sizes that each cost around $25 or $130 for the set. Also available for $9 are some diamond sharpening hones for your punches. Check out the video deminstration from the man behind the square punches, Darrell Peart after the break.